Rob Moll, The Art of Dying: Living Fully in the Life to Come, IVP 2010. Pastor Moll recounts his own awakening to the question of Christian death during the unfolding of the controversial Terry Schiavo case. It seemed to him that the meaning of “pro-life” was being extended beyond its usual limits to indicate a position that supported biological subsistence by any means necessary. This, according to Moll, was hard to distinguish from the unbelieving denial of death. The book sets out to recover that tradition. If it were not for the exigencies of titular brevity, the book could be called The Art of Dying, Comforting, and Mourning, since the book is really about all three. In his review of the history of Christian dying, Pastor Moll finds that earlier generations of Christians were not at such a loss as we are in dealing with death, and it is to them that Moll looks for examples of a better way. He harks back to the Middle Ages, the Reformation, and even the more recent Victorian era to find examples of believers methodically negotiating death with great deliberation and readiness, in what was called ars moriendi, the “art of dying.” This deliberate and devoted negotiation of death was practiced not only by the dying themselves, but by those around the dying too: family, friends, counselors, and caregivers. Pastor Moll approvingly reviews the practices of earlier generations of Christians and Jews; ministerial counseling of the dying, familial tending of the body after death, burial of the dead one with reverent simplicity, and ritual edification and spiritual consolation of the bereaved. The historical picture he draws is an extremely simplified one, but his point can stand regardless. Drawing on the examples offered by previous generations, Moll offers many useful suggestions for attending to the dying and for ceremonially acknowledging the loss to a community that death causes. Moll’s reflections on the Schiavo episode remind us of the high economic and political stakes of how people die in this country. For this reason it is unfortunate that Pastor Moll did not extend his critique to the funerary industry. Surprisingly, he not only gives the funeral industry something of a pass, he goes even further and takes a swipe at Jessica Mitford, whose famous 1963 critique of the funeral industry had a profound effect on American funerary custom and legislation. His point about Mitford’s indifference to the religious meaning of burial is worth noting, but the industry Mitford attacked often operated on presuppositions very difficult to reconcile with Christian belief and historic practice in any case. Her critique was necessary. She can hardly be blamed for the fact that a Christian didn’t make it before her. Moreover, the traditional Christians Moll holds up as exemplars of ars moriendi and pious burial would no doubt have been horrified by the extravagance and expense of much of the kind of American funereal practice Mitford exposed ; as indeed one more recent Christian in fact was, the Catholic novelist Evelyn Waugh, who struck much the same note as Mitford in his scathing 1948 novella, The Loved One. Waugh certainly cannot be charged with indifference to the religious meaning of burial. The evident delicacy with which Moll handles the funeral industry is especially odd given that elsewhere he praises Eastern Christians for their simple preparation of the dead, which is mostly undertaken by the family. By analogy, if a pastor were to write about the need for better marriage counseling and a more Christian understanding of weddings and family, we would be extremely surprised, given the times, were such a pastor to say very little against the extravagance of the wedding industry. If we are estranged from ancient ways of caring for the dying and burial of the dead, it is because we are estranged from more ancient ways of living. If families and communities are to care for their dying and their dead, as Pastor Moll would like, we need to form different, and more Christian, kinds of families and communities; simply finding more personal meaning in funerary ritual will not of itself suffice. If we are to even think of changing our way of death, we will first have to think of changing the very fundamentals of our highly complex and institutionalized way of life. What Simone de Beauvoir has recently said of the prospects for changing our treatment of the aged holds equally true for any efforts that may be made to change our attitudes toward death and the dying. ‘It is the whole system that is at issue and our claim cannot be otherwise than radical: change life itself.’ For is there is…one lesson that the Puritan way of death has to teach us, it is that death cannot be abstracted from life and still retain its meaning. “How then shall we die?” is inseparable from the question of “how then shall we live?” Dying, death and burial are among the first things, like worship, marriage, childrearing, and dwelling; things which must be our own. 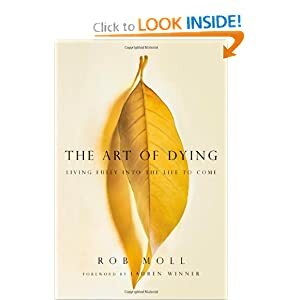 Pastor Moll’s book is, so far as it goes, a useful introduction to the nearly lost Christian art of dying, and can be commended to pastors and caregivers. However, by not connecting the possibility for a return to pious death with social and political critique of the funeral industry in the United States, it stops short of grasping the lesson which the Puritans, in accord with all those Christians of past ages whom Pastor Moll himself invokes, would teach us. The expression of his admiration for Jewish burial customs is marred by a strange insinuation that they lack the hope, following from the Christian faith in the resurrection of the dead, which marks Christian burials: “Christians can learn much from Jewish mourning rituals”, he says; however, he then proceeds with what seems to be a “but” clause, “Because of the resurrection these mourning actions…are for Christians infused with hope. In Christianity death is not the end but a transition to a better, fuller life. Though Christians may find more hope in the their understanding of the resurrection, the Jewish rituals can be powerful” (p 137). But the chief point of difference between the Christian faith and its Jewish sibling is the claim that Jesus is the promised Messiah, not the hope of resurrection as such; for on the latter point, they are agreed. Orthodox Jews are in fact bound to believe in the resurrection of the dead (it is the closing declaration of Maimonides’ 13 principles of faith), they await it joyfully, and this is reflected in Jewish funeral customs, which are certainly not only about grieving; see Maurice Lamm, The Jewish Way in Death and Mourning, Jonathan David Publishers, 1969. It’s surprising that this misconception got past the author of the foreword, who herself practiced for a time as an Orthodox Jew. An example of how a Christian group which follows ancient practices of reverent simplicity can run afoul of the funeral industry can be found here: http://www.bloomberg.com/news/2010-12-23/why-businesses-can-t-stand-free-markets-commentary-by-veronique-de-rugy.html. Surely, given Pastor Moll’s admiration of previous generations, a lesson of the book would be that we ought to be sympathetic to the monks in this case. Stannard, David. The Puritan Way of Death, Oxford UP, 1977: 196.